Flip Flop Embroidery Designs From The Personal Perspective Of Two Embroidery Design Enthusiasts. Embroidered Slippers From India - Flip Flop Special! The Indian shoes were first designed 400 years ago and were called jooti or nagra. Even today, they retain the first position in the world when it comes to the best fashioned footwear. 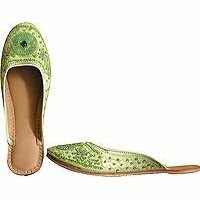 The Indian embroidered shoe is generally made of plain upper leather and the shoe takes the shape of the wearers foot. Have a look at the beaded And embroidered handcrafted leather slippers beside this post which is worn by women. This is studded with beads and the upper portion of the shoe is embroidered with silk thread and decorated with Khasida embroidery. This is generally used as casual wear. You have other varieties of Indian footwear which are adorned with appliqu� and bead work. Dying in various colors or fixing brass eyelets has been another way of decorating jooties. I am doing an analysis of flip flops and footwear of unique varieties and if you have come across anything interesting, do let me know through the contact form below. That would be helpful. Thanks. I just came across a good article on flip flop embroidery designs at Artistic Thread Works - You can search for "flip flop" through the search function - scroll down to find the Florida Sole Beach Bag information. There was a contest run called the Florida Sole Beach Bag Contest where the best flip flop embroidery designs came up for recognition. Genia's designs on her beach bag is outstanding. Genia's story on how she sewed the embroidery designs on the beach bag is really interesting. Here is an extract of her email to Larry "The outline of Florida I did myself, along with the lettering using Designer's Gallery LetterWorks. The bag itself gave me the excuse (like I really needed one) to go fabric hunting. So we, my husband, Mark and Mildred, his Mom, loaded up in the truck and headed out to Pensacola to see what we could find. Crestview is not the biggest town to fabric shop in. With most, all the flip flops were applique embroidery designs and I was on a mission. I managed to get out of town with some really good bargains, came home and sat down and started sewing. I like really bright and unusual color contrast and came up with the combinations that I did. The ones with the fringe flowers is Phyllis' design. Those are my favorites. It's real easy to do as long as you use a contrasting bobbin thread, so it can be seen and cut after it's stitched. Once it's carefully cut, you pull the top thread back through and fluff the threads." The information on embroidery machines would come in handy here.